I added shrimp and dill to this classic Italian soup – a perfect spring lunch or light dinner. Heat a large saute pan to medium high heat and add half the unsalted butter. Season the shrimp with salt and pepper and saute them until they are pink about 3-4 minutes. Remove the shrimp and set aside and add the last of the butter to the pan. Add the spinach and saute until just cooked through about 2-3 minutes, keep warm. In a sauce pan add the chicken broth and the lemon juice and bring to a simmer. In a small bowl beat the eggs with the lemon zest and the dill. Swirl the simmering chicken broth and slowly add the egg mixture in a thin stream. 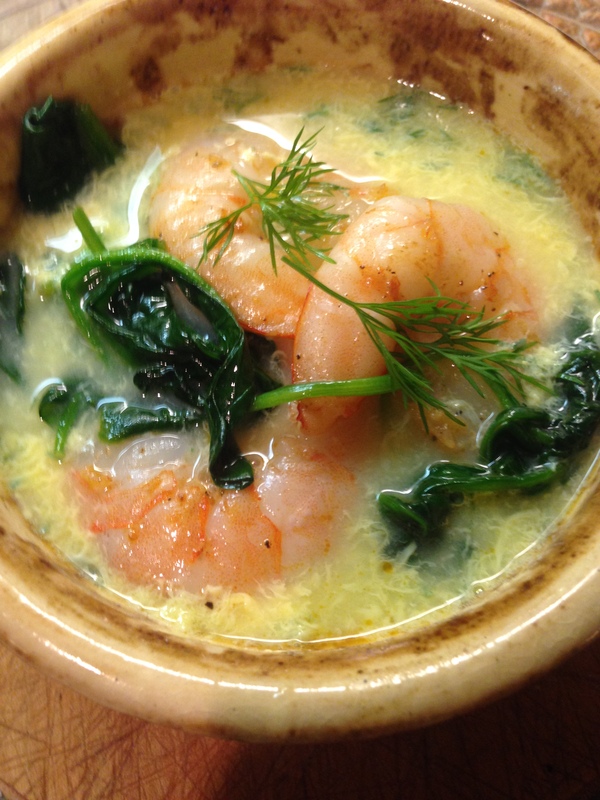 Divide the shrimp and the spinach into 4 bowls and top with the egg broth mixture. Top with grated Parmesan and sprigs of dill. This entry was posted in Recipes and tagged Dill, Eggs, Gluten-Free, lemon, Shrimp, soup, spinach. Bookmark the permalink.